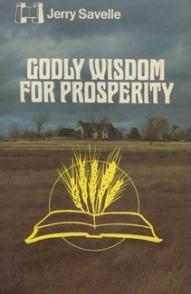 Most Christians desire to prosper but so many lack the wisdom that is necessary to produce it. God's people are destroyed because of a lack of knowledge. Some don't even know that it is God's will that they prosper. On the other hand, some know that prosperity belongs to them but haven't realized the importance of using wisdom. There are laws that govern prosperity. The aim of this book is to teach you how to apply God's wisdom for prosperity. You may have to go back to the basics in order to completely understand Godly Wisdom for Prosperity. You may say, "Oh, I already know all about prosperity." Well, is what you know working for you? The apostle Peter wrote in one of his letters, "... I will not be negligent to put you always in remembrance of these things, though ye know them, and be established in the present truth. Yea, I think it meet, as long as I am in this tabernacle, to stir you up by putting you in remembrance" (2 Peter 1:12, 13). We should never forget the basics. If you have not been acting upon the Word as you once did, you should begin to do so immediately. You may be faced with a crisis and think, "Oh, God! I have to have a great, new revelation to get me out of this jam." About Jerry Savelle: Jerry Savelle is president of Jerry Savelle Ministries International, a ministry of many outreaches devoted to meeting the needs of believers all over the world. He is also the Founding Pastor of Heritage of Faith Christian Center in Crowley, Texas. In January 2006, Savelle appointed Justin Bridges as Senior Pastor. The senior staff now includes: Youth Pastor Jason McKay, and Administrator Lindsey Nichols. The missionary outreach of Jerry Savelle's ministry now extends to over 50 countries around the world. Jerry Savelle Ministries has offices in the United States, Australia, the United Kingdom, Tanzania, and Canada. Savelle hosts a television show that can be seen worldwide on the Daystar television network.